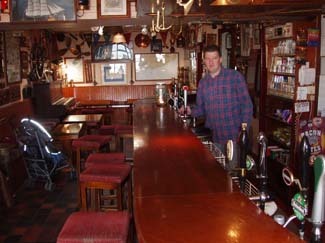 Everyone feels at home in this famous old bar, especially visiting and local sailors. It's choc-a-bloc with genuine maritime artefacts such as charts, tide tables, ships' clocks, compasses, lanterns, pennants et al - but it's the Bushe family's hospitality that makes it really special. Seats 90 (+60 outdoors). 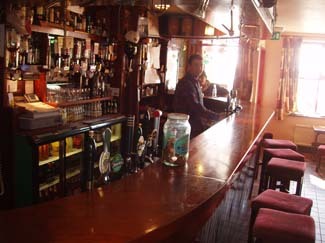 Bar food served 9.30am-5pm daily. Children welcome before 10pm (high chair, baby changing facilities). Full wheelchair access. Bar closed 25 Dec. House wine €20, glass €4.50. *Accommodation: Although not ITB approved, there are three big, comfortable bedrooms over the bar, all with a double and single bed, bath & shower, TV and a kitchenette with all that is needed to make your own continental breakfast. There are also showers provided for the use of sailors and fishermen. Amex, MasterCard, Visa. Since Richard and Eileen took on the bar in 1973, it's been "home from home" for regular visitors to Baltimore, for whom a late morning call is de rigeur (in order to collect the ordered newspapers that are rolled up and stacked in the bar window each day). Now, it's in the safe hands of the next generation - Tom, Aidan and Marion Bushe - so all is humming along nicely. Simple, deliciously homely bar food starts early in the day with tea and fresh ground coffee from 9.30, moving on to Marion's home-made soups and a range of sandwiches including home-cooked meats, good quality smoked salmon, smoked mackerel or - the most popular by far - open crab sandwiches (when available), served with home-baked brown bread. Apple tart & cream to finish, perhaps. 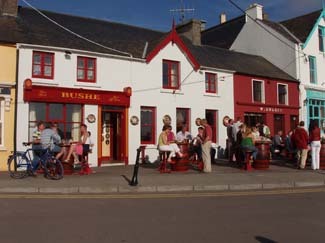 Prices are extremely reasonable - soup with soda bread just €3, crab sandwich €6.95., fresh ground coffee only €1.30. On a sunny day at an outside table you would feel very lucky to be here. 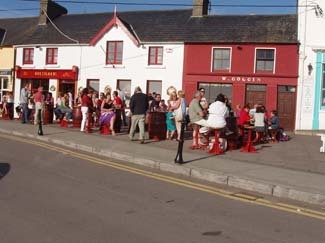 Like all pubs, it can get a little scruffy at busy times, but this is a terrific pub, at any time of year, and was a very worthy recipient of our Pub of the Year Award in 2000. In the middle of Baltimore, on the square overlooking the harbour.